Malabar, Travancore or Cochin Lemongrass Oil. - Oleum Andropogonis citrati. - Ostindisches Lemongrasol. - Essence de Lemongrass. - Essence de Verveine des Indes. Origin and Production. As to the botanical origin of the lemongrass oils of commerce there existed, for a long time, considerable uncertainty and ambiguity. The situation was finally cleared up by the investigations of O. Stapf2) referred to on p. 217. It has been known for some time that the oils distilled on the Malabar coast differed as to greater solubility in 70 p. c. alcohol and frequently also by their higher citral content from other oils, e. g. those produced in the West Indies, Brazil, Ceylon, Java and numerous other places. According to Stapf this is due to the fact that the two oils are derived from different species of Cymbopogon. Whereas the East Indian oil, the lemongrass oil of commerce, is obtained from Cymbopogon flexuosus, Stapf, the more difficultly soluble oil is derived from C. citratus, Stapf3). 1) Report of Schimmel & Co. April 1908, 56. 2) Kew Bull. 1900, 297. 3) By means of experiments made by ). F. Jowitt in Bandarawela (Ceylon) with the cultivation of both lemongrass species, Stapf's assumption has been proven experimentally. The oils distilled from the cultivated grasses were examined in the Imperial Institute in London by S. S. Pickles (Circulars and Agricultural Journal of the Royal Botanic Gardens, Ceylon. Vol. V, N° 12, November 1910, 137. Comp. also Bull. Imp. Inst. 8 , 144). The grasses themselves were once more carefully examined as to their botanical identity by Stapf himself. As to the solubility of the oils, it became apparent that the oil from C. citratus did not give a clear solution with even 10 vols, of 90 p. c. alcohol, whereas C. flexuosus yielded an oil that was soluble in 2,2 vols, and more of 70 p. c. alcohol. Cymbopogon flexuosus, Stapf (Andropogon flexuosus, Nees et Steud. ; A. Nardus var. flexuosus, Hack.) known as Malabar-or Cochin grass, occurs in the Tinnevelly district and in Travan-core. Whereas formerly it occurred wild only, in recent years larger areas have been cultivated with this grass since the wild plant no longer sufficed to supply the demand for oil1). The distillation has also been extended northward so that at present considerable amounts of oil are also distilled in Malabar. Inasmuch as the grass2) demands much moisture but does not flourish unless the soil is drained, it is cultivated principally on the foothills of the Ghats. The principal distillation areas are the "Hinterland" of Anjengo, the hilly shores of the Periyar river in Travancore, and the plantation districts Peermade in Travancore and Nellampatty in the state of Cochin. On the east side of the Ghats and in the Palmi mountains lemongrass oil is also distilled in isolated places. Because of high prices, the production of lemongrass oil had been greatly increased, later, because of price reduction due to overproduction, it was largely cut down. More particularly was this true of the distilleries on large plantations where the distillation was carried on with expensive equipments and labor. In some districts, e. g. in Wynaad, the low aldehyde content of the oil had a discouraging effect on the production. The native farmers, however, appear to work at a profit even at the low price of 2 d. per ounce. The distillation of the oil begins shortly after the beginning of the rainy season, i. e. about the beginning of July, and continues, according to the course of the monsoon which follows the Southwest monsoon, up to and into January. Inasmuch as the Northeast monsoon is scant on the west coast and at times fails altogether, the distillation is discontinued in January on account of the drought. The dried grass is destroyed by fire since the ashes afford a good fertilizer. In the lower places, i. e. when artificial irrigation is possible, the lemongrass must give way to the cultivation of winter crops, principally rice. 1) Comp. also D. Hooper, Chemist and Druggist 70 (1907), 208. 2) The description which follows has kindly been placed at the disposal of Schimmel & Co. by Mr. Werner Reinhart, of the firm of Volkart Brothers in Winterthur, who made a trip into the lemongrass oil districts. Report of Schimmel & Co. October 1910, 77. 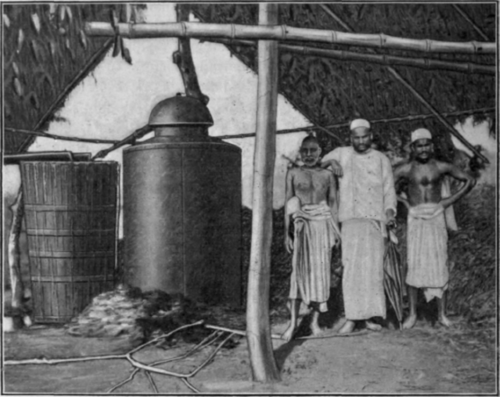 A distillery of the natives, such as is illustrated on this page, fig. 24, usually remains standing all year around. It is always covered by a straw roof resting on bamboo poles. A copper cylinder about 6 ft. in height and 3 ft. in diameter rests on a fire place built of stones and about 1 ft. high. It is not provided with a chimney, but the air has access through the openings between the loosely piled stones. At about one-half its height, the cylinder is provided with a lateral opening, that can be closed by a door through which the grass is introduced into the still and through which it is also removed. The top of the cylinder is closed by a removable helmet, which is connected by means of a copper tube with the serpentine condenser which rests in a wooden vat about 6 ft. high. By means of a wooden trough, water is conducted from a well to the condenser. As receiver a vessel is used that is constructed upon the principle of the Florentine flask, with this difference, however, that it consists of a very wide open cylinder as shown in fig. 25. Fig. 24. Distillation of lemongrass oil in the neighborhood of Alwaye (Travancore). In this manner a large surface is created on which the oil collects and can be skimmed off by means of a spoon. The aqueous distillate flows off through a lateral tube which is fastened to the lower end of the cylinder and passes upward at an acute angle. Contrary to the usual practice, this aromatic water is not used over again for the distillation of a new charge of grass, but is allowed to flow away.